What better way to kick off the new year but with a post about basal sauropodomorphs from South Africa? 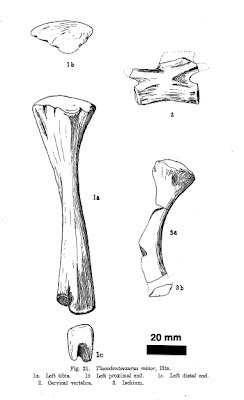 In 1918 Sidney Haughton named a small collection of tiny sauropodomorph bones from the Elliot Formation, near the town of Maclear, Eastern Cape, as Thecodontosaurus minor. There isn’t much to the specimen, just a cervical vertebra, a tibia and a fragmentary ischium. This little guy has remained in almost complete obscurity ever since it was named. All recent treatments that even give it a mention regard it as either a nomen dubium, or as a synonym of Massospondylus carinatus. However there are some odd things about these remains that suggest this taxon deserves a closer look. Firstly it is very small, with the tibia just over 10 cm, a length not much greater than that of Microraptor zhaoianus which is widely cited as the smallest non-avian dinosaur. Usually T. minor is dismissed as a juvenile but this is not necessarily the case because it appears that the neurocentral suture of the cervical vertebra is closed. 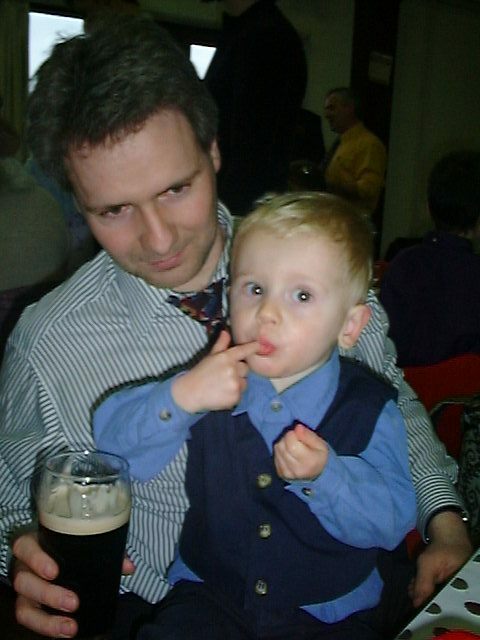 I freely admit that I’ve only ever given the specimen a cursory look, and that this needs to be checked more closely. If it is closed then it would indicate the individual was approaching maturity. One does have to be careful when using the closure of neurocentral sutures to age a dinosaur but in this case there is abundant evidence that basal sauropodomorphs did not close their neurocentral sutures until close to maturity, or even after adult size had been reached. Indeed the majority of all presacral vertebrae preserved in the basal sauropodomorph record have separated along their neurocentral sutures. Now if T. minor really is a mature, or near mature individual, then it would have the smallest known adult size of any sauropodomorph. Just for fun here is the silhouette of a small sauropodomorph scaled to a tibia length of 10 cm, next to the hand of Brachiosaurus brancai. So what else is odd about this taxon? Well the ischium is a little odd. Although incomplete there is a short stretch of the ischial shaft preserved behind the proximal obturator region. This shaft is unusually flattened, whereas most basal sauropodomorphs, have an ischial shaft that has equilaterally triangular cross-section. Amongst basal sauropodomorphs I’ve only seen this type of flattened ischial shaft in Thecodontosaurus, Anchisaurus and Mussaurus. By itself this isn’t enough to hang a taxon on but it is enough to reject synonymy with Massospondylus (unless of course there is postmortem crushing at play, or I've misjudged the amount of ischial shaft that is present). However there is one other aspect of this little fossil that has me kicking myself for not looking more closely at it when I had the chance. It would appear that this little fossil comes from the lower Elliot Formation. This became apparent after I read the original (unillustrated) description, rather than Haughton’s later 1924 illustrated monograph on the fossils of the Stormberg group. Quoting the 1918 paper the horizon in which this specimen was discovered was the “Red beds, just below halfway from base”. As I’ve mentioned before on this blog ‘red beds’ is the old name for the Elliot Formation and this Formation comes has two members, of different age, depositional style and fauna. At the southern end of the outcrop area (where Maclear is located) the lower Elliot makes up about two thirds of the stratigraphic thickness of the Elliot Formation, placing T. minor in the lower Elliot and puts paid to any notion that the specimen is a juvenile Massospondylus. This is remarkable for the sauropodomorph fauna of the lower Elliot consists entirely of large robust forms. Indeed small vertebrate fossils of any sort are exceedingly rare. Indeed there are only two named taxa that would have massed less than 50 kg as adults: the ornithischian Eocursor and the trithelodontid cynodont, Elliotherium, both of which are based on unique specimens. 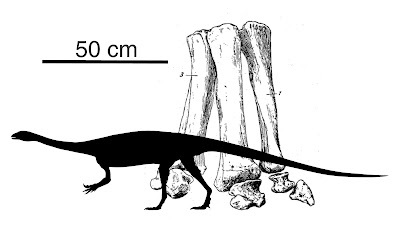 A minute sauropodomorph from the Triassic of South Africa would be an interesting and welcome addition. So is T. minor a valid taxon? That is a difficult question. The known remains do not present any obvious autapomorphies other than its tiny size. If it can be confirmed either by histological sampling of the tibia, or micro ct scanning of the cervical vertebrae, that these are indeed the remains of a mature individual then, yes I think it would be a valid taxon, though just barely (on the basis that it can be excluded from all other known Triassic sauropodomorphs on the basis of size and the mix of characters it displays). Sadly the known remains are utterly inadequate for narrowing down its phylogenetic placement among basal sauropodomorphs, it could easily fall anywhere between Thecodontosaurus and Melanorosaurus. So there is little justification for keeping it in Thecodontosaurus, a new name will have to be coined for it but I think that that action would be best held off until such time as better remains come to light. I just hope that I might find some on my next field excursion. Haughton, SH (1918) On a new dinosaur from the Stormberg beds of South Africa. Ann. Mag. nat. Hist. 2: 468-469. Haughton, SH (1924) The fauna and stratigraphy of the Stormberg series. Ann. S. Afr. Mus. 12: 323-497. Irmis, R.B. 2007. Axial skeleton ontogeny in the Parasuchia (Archosauria: Pseudosuchia) and its implications for ontogenetic determination in archosaurs. Journal of Vertebrate Paleontology 27(2):350-361. It should be renamed Adorablosaurus! You just need to get out there and dig up more of these things. Thanks for sharing this, Adam, it's fascinating. You image of this beast next to Janensch's brachiosaur-hand reconstruction is one of those fine illustrations that hit you in the gut rather than just the brain. Gosh, sometimes, I think I picked the wrong science... I mean, who doesn't want to be a paleontologist at some point in their life? Wow!! I've always thought that sauropods were huge!! I guess we were originally wrong...or I was. It isn't actually a sauropod (though exactly what is and what is not a sauropod is a matter of debate) it is a basal sauropodomorph, that is a close relative of the ancestors of sauropods but not actually a member of the clade.